When it comes to Jet table saws, you have a wide range of choices. You have benchtop saws, contractor saws, deluxe Xacta saws, hybrid saws, ProShop saws, and Xacta saws to choose from. Let us take a detailed look. These saws come with a 10" blade, wing extensions, smooth speed belt drive transmission which reduces vibrations to a great extent, Precision Rule measurement system, miter slots which provide complete control of the miter gauge for better quality cuts, and side handles. Almost all the reviews mention that these saws are easy to lift and move around in the workplace thanks to the contoured side handles. These saws come with a cast iron table with miter slots, extension wings made of steel, blade guard with splitter, anti kickback pawls, 1½ HP motor, a unique double drive power system to transmit power to the arbor efficiently, strong one piece trunnion, dust collection port, miter gauge with positive stops, and a steel leg stand which offers stability to these saws. A lot of reviewers say that few other table saws match these saws when it comes to safety, power, and precision. Important features include a 30" Xacta fence, quick release riving knife, push button arbor lock, dust collection port, cast iron table top, heavy duty trunnion, miter gauge with positive stops, magnetic switch which offers thermal overload protection, poly V belt drive system which improves efficiency and reduces vibrations, and an independent blade safety guard. Prominent features include a T square fence, heavy duty handwheels for precise adjustments, power switch, powder coated paint which offers a long lasting finish, two cast iron wings which offer a large work surface, 1¾ HP motor, and dust port. These Jet table saws are the ideal choice for people looking for a high end cabinet saw. Notable features include cast iron table with T style miter slot, left tilting cast iron trunnion, an enclosed cabinet with leg stand, integrated arbor lock, T square fence, dust port, saw blade, and more. 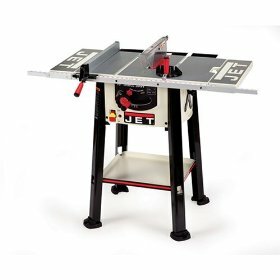 These Jet table saws come with sturdy cast iron wings which increase the work surface considerably, rail mounted magnetic switch, chrome plated handwheels for smooth arbor movement, dust collection port, and a safety system which includes blade guard with splitter and anti kickback pawls. An important point that a lot of reviewers have mentioned is that these saws come with a left tilting, wide stance trunnion which offers a lot of stability to the unit. If you are looking for a trustworthy company to buy table saws, Jet would be a good choice. You can pick a table saw of your choice depending on the features and your budget.